You thought it was safe to drive 90 miles an hour on a rain-slicked narrow road while you were tipsy because the airbag would save you, but it still hurts when you crash. This is the Paradox of Risk: the more risk is apparently lowered, the higher the risk we are willing to accept. I recently covered a related topic, The Dangerous Illusion That Risk Can Be Offloaded Onto Others (October 2, 2015). The paradox is that believing risk has been eliminated leads us to take on insane levels of risk--levels that we would never have accepted before, levels that essentially guarantee our financial destruction. 1. The Fed Put, the belief that the Federal Reserve will never let stocks decline by more than a few percentage points before it steps in and saves the market from any further decline. 2. The belief that hedges dependent on counterparties paying off when the market craters have effectively transferred risk to others. 3. The belief in Modern Portfolio Management, i.e. that risk can be hedged or reduced to near-zero by diversifying one's portfolio, investing in assets with low correlation, etc. All of this is nice, but fatally flawed. Max and I discuss the reality that markets are not linear, they are fractal. Central planning is linear, but reality is non-linear. The net result is the Fed can do whatever it wants, whenever it wants, and markets will still crash from time to time. That markets crash is predictable, but not when they crash. I've prepared a chart that depicts the downside of the Paradox of Risk:everyone who believes in the Fed Put, hedges or Modern Portfolio Management will view any decline in stocks as temporary. As a result, they won't sell as markets plummet. When markets finally hit bottom, believers will assure themselves that the Fed is going to push stocks higher any day now, because they have always done so in the past. When central planning efforts to push stocks back up falter, the believers that risk has been banished grow frustrated; come on, Fed, do whatever it takes! 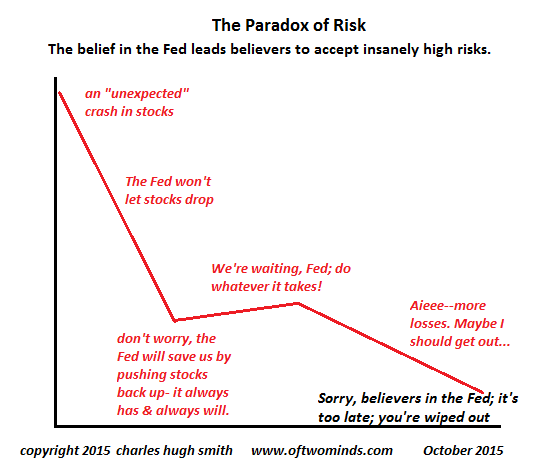 Alas, the Fed has done whatever it takes but it has failed to produce the desired effect. Now the market starts another slide to fresh lows, and the believers finally start recognizing that risk has not been disappeared: counterparties start failing, hedges don't get paid off, and a sense that events are spiraling beyond the control of central planning is spreading. Thank you, Max J. ($50), for your superbly generous contribution to this site -- I am greatly honored by your steadfast support and readership. Thank you, Jason C. ($10), for your most generous contribution to this site -- I am greatly honored by your support and readership.